Hannah Olson, the brains behind Chronically Capable. When 22-year old Hannah Olson was diagnosed with late-stage chronic neurological Lyme disease several years ago, she thought she had things under control — that the aggressive, expensive treatment she was prescribed for this condition was working. After all, she was no longer dizzy, wasn’t having trouble seeing, and that throbbing pain behind her eyes had disappeared. Migraines and forgetfulness were no longer her new norm, and performing simple everyday tasks, such as tying her shoes, was no longer a chore. But she was still tired. And this recurring fatigue recently resulted in not one, but several sudden collapses, and a couple of hospital visits over the course of 10 days. Her employer — a Washington, DC-based tech start-up — was empathetic. 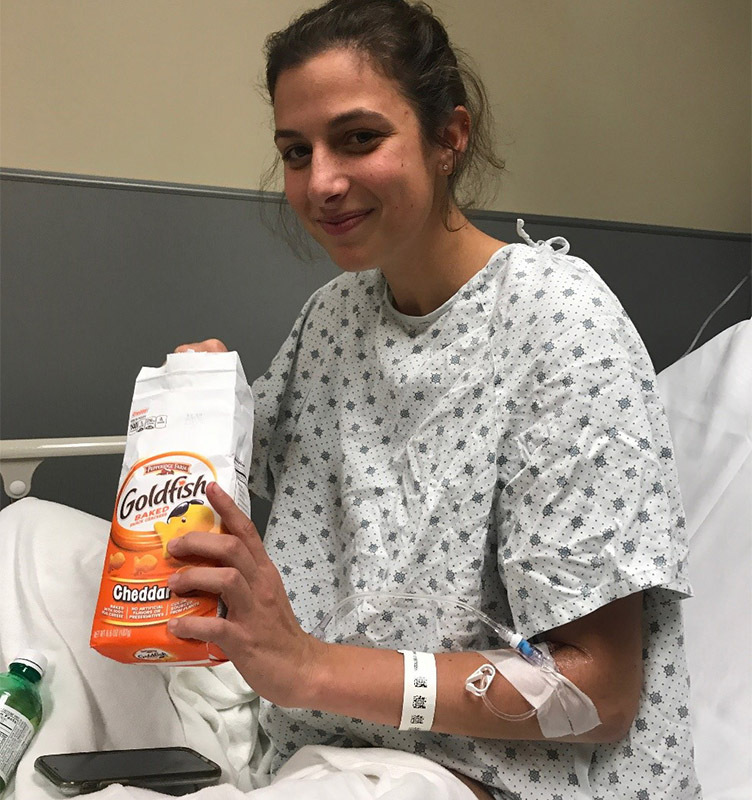 After all, her supervisors knew of Hannah’s condition when they hired her last year — a condition that currently entails administering intravenous (IV) medications eight hours-a-day through a peripherally inserted central catheter (PICC) line in her arm and taking a daily concoction of oral antibiotics and herbal supplements. In fact, that’s one of the reasons Hannah, who had burned out in her previous job managing both her health and responsibilities as a digital strategist, joined the start-up. And when prompted to come up with ideas as to how to improve work culture utilizing the company’s technology, Hannah leveraged her personal experience and made the perfect pitch: Since those with health restraints cannot work the traditional 9-to-5 job, why not connect them with employers who offer remote opportunities or flexible work with health benefits? The team liked the idea so much that they are now collaborating on a platform — aptly called Chronically Capable — that will soon be available to the masses. HealthCentral (HC): It sounds like this was an easy sell — was it? Hannah: This was something I had been thinking about for a while. My friends kept expressing this pain point, and people were always talking about this in support groups, so I knew there was a need here. The statistics show that 133 million people live with at least one chronic condition; by 2020, half of the population will be living with at least one chronic condition. Managing a chronic illness is a full-time job on its own, which makes working a traditional 9-5 nearly impossible. HC: How did you get the ball rolling and put this idea into play? Hannah: We launched the idea organically on social media (using my personal Facebook and Instagram accounts) on October 1, 2018. The launch date was intentional since October is national disability awareness month. I was honest and vulnerable in my post, and just told my story including a link to my website (which at the time was just a landing page) where visitors could sign up to learn more. The response was overwhelming! And when a local radio station picked up the story, that drove a ton of traffic. We saw a huge spike — thousands of people were expressing their interest. HC: What are you doing to build on that momentum? Hannah: We’re working on getting the word out beyond our network by taking a more targeted approach so that we reach the right people who are truly searching for these unique work opportunities. We’re building partnerships with non-profits within the chronic illness space and hoping to create strong, lasting relationships with them. We’ve also been building out the beta version and adding different features. For example, we recently added a blog component, and tabs so people can go on to the site and upload their resumes. Most recently, we created a promotional video, which tells the story of how Chronically Capable was born. HC: Do you have a launch date in mind? Hannah: The official launch will happen sometime in early 2019. The beginning of the year is a good time to launch because that’s the time of year when people are looking for jobs. Whether it’s an in-person event or a video campaign, we want to build a strong marketing campaign, something that goes viral. For now, we’ve been setting goals and every week we’ve been hitting those goals. It’s really the momentum that proved to us that this was worth doing and encouraged us to kick this out sooner rather than later. HealthCentral: What are your hopes/expectations? Hannah: My hope is that this will turn into a product people that will actively use and that we’ll start to have success stories. I, like the many people suffering from chronic illness, am capable of being an instrumental part of the workforce. Nobody should have to apologize for their condition or have to choose between their passions and their health. A Rash With Flu-Like Symptoms: What Could It Be? What’s New in Lyme Disease Research?